There has much discussion on the potential risks of genetically modified crops. However, Yukio Tosa’s research group at Kobe University has recently shown that more conventional modification of crops can also lead to problems. Widespread opposition to genetically modified crops is a frustrating trend for many biologists. From the perspective of most biologists, almost no agricultural product is ‘natural’. Cows, corn, chicken and many other foodstuffs have all been genetically modified by farmers, both ancient and modern, by selective breeding. Also known as artificial selection, selective breeding is used to make crops and animals more productive and profitable. Breeders have changed genetics by deciding what gets to reproduce on the farm and what gets eaten before reproduction. Biotechnology that adds foreign genes to farm livestock or crops would seem to be just a more efficient procedure for producing genetic change, not something radically different. In their paper, ‘Evolution of the wheat blast fungus through functional losses in a host specificity determinant’ by Yoshihiro Inoue et al., the Tosa research group traces the origin of a new fungal parasite in wheat to the introduction, starting around 1980, of a new variety of wheat well-adapted to nonacidic soils. Plant immunity against disease-causing microbes can range from the general to the more specific. Pathogen associated molecular patterns, also known as ‘elicitor’ molecules, are found in a wide variety of microbes. They are recognized by pattern recognition receptors on the cell surface. Avirulence factors are elicitors that are specific to certain pathogens, and are recognized by resistance factors. ‘Pathogens’ cause disease; they are the genesis of illness, or ‘pathos’. On the other hand ‘virulence’ means the ability to cause disease, while ‘avirulence’ means the inability to cause disease. Specific resistance and nonspecific resistance typically use the same mechanisms, but with specific resistance being more intense. The mechanisms used to fight off pathogens include thickening the cell wall, hormone signaling, formation of oxidation agents, changes in gene expression, and cell suicide. Cell suicide deprives the pathogen of the resources of a living cell with which to make its beachhead. Avirulence genes in the pathogen, and resistance genes in the plant are thought to act as antagonistic odd couples. This means that if a plant has the resistance gene, it can ward off infection by the pathogen that exhibits the corresponding avirulence gene. A new threat to wheat farming worldwide is Wheat Blast; it is closely related to fungi that infect rice, millet, oat and ryegrass. In earlier work a sample of blast fungus taken from oat was shown to contain two genes, PWT3 and PWT4 that operated as avirulence genes in wheat. Fungi with either of these genes cannot infect most wheat varieties. RWT3 and RWT4 were identified as the corresponding resistance genes in wheat. Microscopic close-up of a wheat blast spore. Credit: Paul Bachi. The Tosa group was able to show that wheat that lacked RWT3 allowed blast fungus with only PWT3 to infect. Also, wheat that lacked RWT4 allowed fungus with only PWT4 to infect. Furthermore, they were able to show that the fungus now known as ‘Wheat Blast’, that is causing so much damage, lacks both avirulence genes, PWT3 and PWT4. So, this means that no wheat should be resistant - even if they have the resistance genes. The title of the paper, ‘Evolution of the wheat blast fungus through functional losses in a host specificity determinant’ can be interpreted to mean ‘the wheat blast evolved from other blast fungi by losing its avirulence genes’. One could be forgiven for thinking that was sufficient explanation for the epidemic of Wheat Blast crop damage, but the actual chain of events is more complicated. Going back in time, to around 1980, a new variety of wheat called Anahuac, was introduced in Brazil because it did well in soils that weren’t acidic. The Tosa group was able to show that this variety of wheat lacks the resistance gene RTW3. The loss of this resistance gene in this wheat variety seems unintended. This wheat was grown alongside normal wheat. It apparently was in Brazil that this blast fungus first jumped into wheat. The hypothesis is that the blast fungus with only avirulence gene PTW3 (having already lost PWT4) jumped into the Anahuac variety because it lacked the RWT3 resistance gene (although it still had RWT4). Once it was established in RWT3-less wheat it was tempted by the nearby wheat fields with both resistance genes. Some blast fungus then made the jump into wheat with resistance genes by losing its last avirulence gene, PWT3. 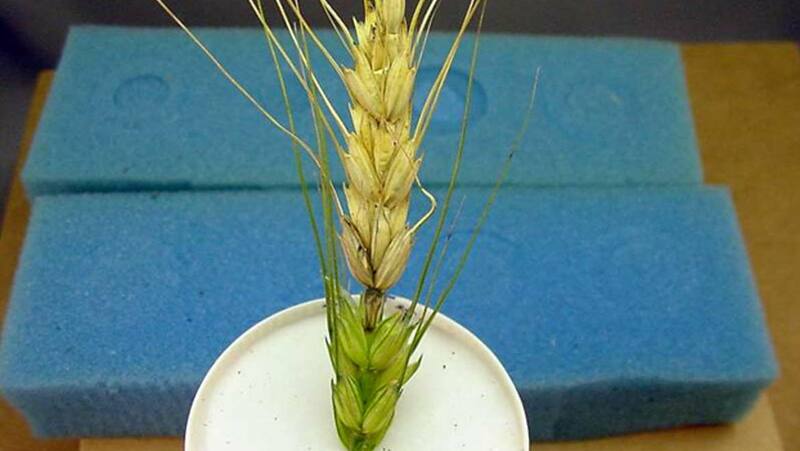 As a result, Wheat Blast (without avirulence genes) strides across the world causing extensive damage in fields as far away as Asia, heedless of the presence or absence of resistance genes. Incubating the evolution of Wheat Blast in a modified wheat crop is the kind of unintended consequence often ascribed to GMO crops - crops modified by the introduction of new genes by biotechnology techniques. However, the Anahuac wheat variety was produced to grow well in Brazilian soil through traditional means. Existing varieties were cross-bred to produce a variety that grows well in nonacidic soils. Somehow, during this process a resistance gene was inadvertently lost. Thus, Anahuac wheat became a home for blast fungus from other plants, despite the fact that these fungi still retained one avirulence gene. So, any genetic modification can be beneficial, such as promoting growth in nonacidic soil, can also have unintended consequences like Wheat Blast evolution, regardless of the techniques used to produce the genetic change. Each new modification needs to be evaluated on its own merits, regardless of its origin. The evolution of Wheat Blast in a new, commercially available crop variety is a good argument for preserving heirloom seeds from antique varieties of crops in case future unintended consequences demand a return to a previous crop. Unfortunately, in the case of Wheat Blast there is no going back, only forward. The development of the new variety enabled the evolution of a pathogen that attacks the old variety. A solution to this problem may require further genetic modification of current varieties of wheat. You may argue against any future innovation in agriculture. This is also impossible. Agriculture itself was invented by hunter-gathers only 12,000 years ago. It is by definition ‘unnatural’ and unsustainable without continuous tweaking. In addition, the population of the earth is expected to increase from 7.3 billion to 9.7 billion by 2050. Current agricultural practice will not be able to feed these additional people without new crop varieties and practices. Inoue, Y. et al., 2017. Evolution of the wheat blast fungus through functional losses in a host specificity determinant. Science, 357(6346), pp. 80-83. Maekawa, T. & Schulze-Lefert, P., 2017. Caught in the jump. Science, 357(6346), pp. 31-32. Available at: https://phys.org/news/2017-07-wheat-lost-evolutionary-deadly-fungal.html [Accessed 20 July 2017].